So has said the American poet H.W.Longfellowe in his poem “The Psalm of Life”. The late Palghat Rama Bhagavathar was not born great nor was greatness thrust on him. He became a “great man” by his total dedication to Carnatic Music and “departed leaving behind him foot prints on the sands of time” ever firmly, ever perceivable and non-erasable. The Tamil poets Avvaiyar has said, “Rare is it to be born as a human being, rarer still is to be born with one’s body and mind without defects and rarest of all is to have one’s faculties fully functional and focused in the service of God and One’s fellow human beings”. Rama Bhagavathar with his blemish less body, mind and soul directed all his faculties with single-minded devotion in the service of his chosen Deity, Lord Rama and in giving bliss and delight to his fellow human beings through the medium of Carnatic music. It is said god created man in his image. It is perhaps left unsaid God created Music, he symphony of life, in His voice and sound. Music is divine and external. We learn that the seven fundamental of our Music, “Sa, Ri, Ga, Ma, Pa, Da, Ni” originated from the sound of the hand-held “damaru” of Lord Siva and how many thousands of songs have sprung from these seven notes. It is only a chosen few among God’s creations who through their Music enlighten their own lives and bring joy and happiness to the lives of people around them. Rama Bhagawathar was one among those rare few who had that gift of God. Through his Music soaked in Bhakthi he showed that Music is the best spiritual restorative to our lives troubled by strife’s and struggle. For him Music was the "summum bonum" of life and wherever he sang, he wafted around him the fragrance of his delightful music. There seems to be a unique chemistry that binds the earth, the water and minds of certain people together in Music that are born in places situated on river banks. Saint Thygaraja, Muthuswami Dikshithar, and Shyama Sastry all were born on the banks of the Cauvery. Likewise, Rama Bhagavathar was born to poor parents in an unknown village situated on the banks of the Bharatha Puzha in a remote corner of Kerala. Despite all odds by didn’t of his tireless efforts and unwavering devotion he raised to Himalayan heights in Carnatic Music. His modest home in Old Kalpathy, Palghat still seems to echo his raga alapanas, swara prastharas, sangathis and kalpana swaras. The author has his in his own humble way sought to pay his respects and regards to such a glorious and great man for whom Music was life and life was Music through this writing and he bows his head in obeisance to that great man. If this writing spurs the readers on to further enquiry and exploration in the Bhagavathar’s achievements in Carnatic Music, they will be rendering a great service to the cause of Carnatic Music. The author wishes to place on record and acknowledges gratefully and thanks Shri.M.R.Sesha Mani, Shri.M.R.Ramanan and Shri.R.Lakshmi Narayanan, all Sons of Rama Bhagawathar and Shrimathy R.Kanakam, Daughter of Rama Bhagawathar for providing him with the details of their father’s birth, life and achievements and for giving useful suggestions in writing this monograph. Palghat Rama Bhagavathar was born on 5th June, 1888 in The Village Munda Mukha near Shoranur to Shri Kasturi Ranga Iyer and Shrimathy Alamelu Mangai, as their fifth and last son, His father was a village revenue official. The family of Shri Kasturi Ranga Iyer was by no means affluent. He had a modest income which helped meet the barest needs of a typical family of Shri Iyer, his wife and five sons. They had a small and an unpretentious home which in those remote days neither had electric power supply nor piped water supply. A well in the backyard of the house supplied their needs of water. The village was on the banks of the Bharath Puzha. The presiding Deity of the village was Lord Ayyappan. Much is not known about the early childhood days of Rama Bhagavathar except that he attended the village school and also learnt Vedas and Shastras. Rama Bhagvathar’s elder brother Venkatakrishna Bhagavathar had a flair for classical music and he started learning Kathakali Padams and in course of time became an exponent of the Padams. He taught young Rama Bhagavathar who had a natural aptitude for classical music to sing along with him Kathakali padams. Rama Bhagavathar was then eight years of age. His Brother Venkatakrishna Bhavathar’s endeavor in instilling by frequent repetitions the Padams laid a firm foundation in Rama Bhagavathar to learn not only Kathakali Padams but the nuances, intricacies and complexities of classical Carnatic Music. At the recommendation of some elders in the Village Munda Mukha, Rama Bhagavathar and his elder brother Venkatakrishna Bhagavathar began to learn Carnatic Music from one Shri Vadankkancheri Rama Bhagavathar and his brother subbarama Bhagavathar. In a sense one could day Vadakkancheri Rama Bhagavathar was the first “guru” of Rama Bhagavathar. Shri Venkatakrishna Bhagavathar, the elder brother of Rama Bhagavathar was fully into Kathakali Padams (which he had learnt from a Nambudari). Since Kathakali performances in those days used to be held only during nights and that too for hours at a stretch, it began to tell on the health of the young Rama Bhagavathar. So his brother Venkatakrishna Bhagavathar advised him to quit singing Kathakali Padams and instead focus on classical Carnatic Music, which then was attaining popularity, thanks to the Kumbakonam and Thanjavur schools. Rama Bhagavathar took his elder brother’s advice in all earnestness and thus was born a Carnatic Music exponent of matchless talent, comprehension and acumen, who in his later life became a shining star in the firmament, a role model for great musicians in the world of Carnatic Music. The early lessons, which Rama Bhagavathar took from Vadakkancheri Rama Bhagavathar and his brother Subbarama Bhagavathar apart from giving him groundwork, and an introductory course in Carnatic Music, did not go far enough. Those were days when persons who wished to learn Carnatic Music had to stay with a guru as live-in disciples in the guru’s home doing odds and ends including cooking and helping the guru’s wife in the kitchen, washing his clothes, apparel etc. They learnt music more by listening to the songs sung by the guru while he was engaged in self-practice. If the guru so wished, at his pleasure, he may teach a song or two to the disciple. The disciples, therefore, not only had to be alert but ever ready and always handy and available to respond to the guru’s commands. It is a great tragedy that such a “guru-sishya parampara” which gave to the world of Carnatic Music such giants as Tiger Varadchariar, Maharajapuram Viswanatha Iyer, Semmangudi Srinivasa Iyer and many others have almost become extinct. In its place have sprung music schools where music is doled out or sold like subway sandwiches. Classical Carnatic Music is not like some fast food or take – out food. It needs years and years of unremitting and relentless learning and practice before one can call himself or herself as someone who knows music. Rama Bhagavathar belonged to the extinct species of the “guru-shishya Parampara”. Not satisfied with what got from Vadakkancheri Rama Bhagavathar, Rama Bhagavathar at the suggestion of his mother Alamelu Mangai and his elder brother Venkatakrishna Bhagavathar, when he was just 12 years of age, left for Thondikulam, a small village near Noorani in Palghat. In a way it was Providential for him to leave his home in Munda Mukha village, for the Bharatha Puzha on whose bank the village Munda Mukha stood ran in spate because of torrential rains and the flood waters of the river entered the village and totally devastated it. Rama Bhagavathar’s quest for a career in classical Carnatic Music took him to Thondikulam. He took shelter in a choultry in Thiruvilwamala, a village on his way to Thondikulam. While he as having his meal in the choultry, he was told by others like him having their shelter in the choultry that if he managed to get entry into the household of Thondikulam, Anantharama Bhagavathar who was then a doyen of Hari Katha Kalakshepam, he could become a disciple of Anantharama Bhagavathar by gaining his confidence. Rama Bhagavathar finally wended his way to Thondikulam, where he was taken to the household of Anantharama Bhagavathar and introduced to him by one Lakshmana Iyer, a Good Samaritan. The first question that Anantharama Bhagavathar asked of Rama Bhagavathar was whether he knew ho to cook. Poor Rama Bhagavathar who had not even peeped into the kitchen at his home in Munda Mukha with a straight face said he knew cooking so as to gain entry into the household of Anantharama Bhagavathar. Anantharama Bhagavathar's wife was a compassionate and understanding woman. She knew immediately that Rama Bhagavathar was after all a young man of 12 years of age and was a novice in the kitchen. She took Rama Bhagavathar in her fold and shrewdly covered up his lack of knowledge in cooking and that was a turning point in his life. Hearing him sing during the Hari Katha Kalashepams, the discerning audience advised him that he should enter into the field of classical Carnatic Music where a much better future awaited him. Rama Bhagavathar took their suggestion seriously and in the right spirit. Ramaswamy Sivan, the brother of Maha Vaidyanatha Iyer prevailed upon and encouraged the budding musician in Rama Bhagavathar to participate in Saint Thygaraja annual Music festival at Thiruvaiyaru and Rama Bhagawathar ensured that he participated in the festival every year without fail. Rama Bhagavathar created for himself a rich repertoire of Krithis. He also learnt a large number of krithis of other great vaageyakarakas like Muthuswami Dikshithar, Shyama Shastri, Gopala Krishna Bharathy, Swati Thirunal, PattanamSubramania Iyer, His Highness the late Maharaja of Mysore Shri Jaya Chamaraja Udayar Bahadur, Mysore Vasudevachar, and many others. He was as proficient in rendering krithis in Telugu and Kananda as he was in Tamil and Malayalam. He had also learnt a few abhangs in Marathi, thanks to his association with the great violin maestro Mysore Chowdiah, who had temporarily shifted his residence for about 3 or 4 years from Mysore to Old Kalpathy at the bidding of Rama Bhagavathar and accompanied him on the violin in many of Bhagavathar’s performances. After he completed his discipleship under Umayalpuram Swaminatha Iyer, Rama Bhagavathar returned to Thondikulam and became a part of the troupe of his guru Anantha Rama Bhagavathar. But the latter overtaken by ailments had retired from the field of Hari Katha Kalashepam and his end came when he was just 49 years of age. SETTING OF HIS HOME AND HIS BARIER IN MUSIC Rama Bhagavathar after the death of his guru Anantharama Bhagavathar decided to be on his own, his forte being classical Carnatic Music. He was 23 years of age and got married to Shrimathy Rukmini who was then 9 years of age. At the suggestion of Anantharama Bhagavathar he set up his home at Old Kalpathy, Palghat. He first took a house on rent and later on bought his own house near the house he had rented and renovated it. He named his house as “Guru Prasad” in memory of his Guru Thondikulam Anantharama Bhagavathar. Every year till he passed away, Rama Bhagavathar performed a Guru Puja in memory of his guru and mentor as well, the late Anantharama Bhagavathar, on the day of the latter’s death anniversary. Feeding of guests followed the Guru Puja. The house he had bought is still existing, going strong and is still the home of his children, grand children and even great grand children. Rama Bhagavathar settled down in Old Kalpathy, Palghat in 1910 and remained a resident of that village till his last days in 1957. Rama Bhagavathar, after the demise of Anantha Rama Bhagavathar, began giving music performances. He has given performances in all most all towns and cities. To mention a few he was a regular invitee to give performances in Madras, Bombay, Bangalore, Delhi, Jabalpur, Coimbatore, Thiruvanthapuram, Mysore, Devakottai, Karaikudi, Madurai, Puthukottai and many other places small and big. He was regular artist in the All India Radio in Trichy and Calicut Stations. He performed in the Music Academy in Chennai (then Madras) in 1927 when the Academy was in its initial years of being established. Rama Bhagavathar’s divine music attracted “rasikas” in large numbers. His rendering of Ragam, Thanam and Pallavi used to be a masterly performance. In those days, music concerts used to last for even up to 5 hours, and Rama Bhagavathar was never found wanting in stamina to withstand such a marathon performance, and that too without microphone and loud speaker. He chose ghana ragams like Bhairavi, Kalayani, Todi, Saveri, Dhanyasi, Sankarabharanam, Karaharapriya and many others and the elaborate “raga alapanas” brought out the nuances and subtleties of the ragas. Some of the old timers who are still alive recall nostalgically his rendering of Krithis like “Rama Nee Samana Evaru” in the raga “Karaharapriya”, “Akshayalingavibho” in “Sankarabharanam”, “O, Ranga Sayee” in “Kambodhi”, “Parama Pavana Rama” in “Poorvi Kalyani”, “Hari Ne Nindu Veda Kudura” in “Karnataka Behag”, “Bhajare Re Chitta Baalaambikaam in “Kalayani” and many others. His rendering of Gopalakrishna Bharathi’s “Varugalamo Ayya” in “Maanji” was so emotive that listeners were very often moved to tears. 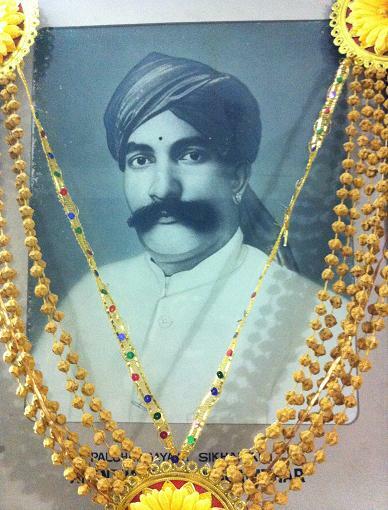 The late Maharaja of Mysore, His Highness Shri Jaya Chamaraja Udayar Bahadur, who himself was an accomplished music maestro (his famous composition in the raga Bilahari, “Shri Chamundeswareem Palayamam” was sung by no less a person than Sangeetha Kalanidhi Shrimathy M.S.Subbalakshmi in her special concert in the United Nations in New York) used to regularly invite Rama Bhagavatar to his Durbar in Mysore during Dusshera festival for special performance and honored him as benefits a vidwan of such great merit. So did the late Maharaja of Travancore and the Maharani of Travancore Shrimathy Sethu Parvathy Bai. The late Physics Nobel Laureate Dr.C.V.Raman honored him with the title of “Gayaka Kesari”. His Holiness the Mahasannidhanam of Sringeri Sarada Peetham and His Holiness the Paramacharya of Kanchi Kamakoti Peetham honored him with shawls, bracelets and chains made of gold. The author’s late maternal uncle narrated to him an incident in Rama Bhagavathar’s life to which he was a witness. A concert had been arranged in one of the villages in Palghat and Rama Bhagavathar was the main artist. He was accompanied on the Violin by the late Papa Venkataramaiah, on the Mirdangam by the late Palani Subramania Pillai and on the Ghatam by the late Thiruvilvamala Vilvadri Iyer. In the first row among the audience was seated the late Maharajapuram Viswanatha Iyer, Rama Bhagavathar’s long Standing friend and co-disciple with Umayalpuram Viswanatha Iyer. After a few krithis, Rama Bhagavathar began his alapana of “Karahara Priya” and then followed the famous Thygaraja Krithi “Rama Nee Samana Evaru”. Rama Bhagavathar began to sing and sangathis after sangathis flowed from him. After 35 or 40 sangathis, Maharajapuram Viswanatha Iyer, a regular visitor to the household of Rama Bhagavathar at Old Kalpathy, Palghat, who was seated just in front of him was in great ecstasy and could not contain himself. He rose from his seat, went to the dais and hugged Rama Bhagavathar exclaiming, “Rama, Nee Samana Evaru” meaning “Rama who is there who can render this krithi like you”. The whole audience rose in applause. Rama Bhagavathar was requested by many persons to settle down in Madras where they said his genius in Carnatic Music would spread far and wide and shine better. They cited the example of musicians like Maharajapuram Viswavanatha Iyer, Semmanmgudi Srinivasa Iyer, Chembai Vaidyanatha Bhagavathar, Palghat T.S.Mani Iyer and many others who had made Madras their home. They even said that he might get the much-coveted Sangeetha Kalanidhi award. But Rama Bhagavathar was not swayed by those blandishments and said that he preferred to stay in his home in Old Kalpathy, Palghat where the Nila River flowed behind his house, on the right was the Temple of Lord Lakshmi Narayana Perumal and on the left the Temple of Lord Kasi Viswanatha Swamy. He was a great Rama Bhaktha. Money or fame did not lure him. The Maharaja of Travancore invited him to Thiruvanthapuram to take over as the Principal of the famous Swati Thirunal Academy of Music. Rama Bhagavathar declined even that offer. For him the daily Darsanam of Lord Lakshmi Narayana Perumal and Lord Viswanatha Swami was for more important that the principal-ship of the Swati Thirunal Academy. “Mahima Telliya Tarama” in Sankarabharanam” set to Rupaka Tala. Thekrithi is by Anai Ayya. “Innamum Oru Daram” in “Yadukula Kambhoji” in Adi Tala, Gopalakrishna Bharathi’s Krithi. “Tirumangal Ulavum” in Kalyani Vasantam” ragam. "Enta Ninne” of Saint Thyagaraja in “Mukhari” raga set to Rupaka Tala. 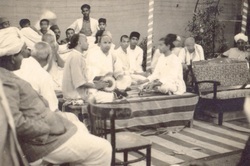 Bhajare Re Chitta Baalaambikaam” in the raga “Kalyani”, a krithi of Muthuswamy Dikshitar set to Mishra Chapu Tala. There could be many others but one wouldn’t know where to look for them. Rama Bhagavathar and his wife Ruckmani had seven sons and four daughters. A son and a daughter passed away. His second son, Shri.M.R.Seshamani for sometime accompanied Rama Bhagavathar in his Kuthceries. Seshamani then became a disciple of the late G.N. Balasubramaniam. Rama Bhagavathar’s forth son, Lakshmi Narayanan accompanied Rama Bhagavathar for the rest of the Bhagavathar’s life. But it is unfortunate no son or daughter could rise to the level of Rama Bhagavathar as a classical Carnatic Music genius. Rama Bhagavathar started his career in music with his first performance in the precincts of the Temple of Lord Kasi Viswanatha Swamy in Kalpathy, Palghat. His last performance in June 1957 was also in the precincts of the Temple of Lord Kasi Viswanatha Swamy, which was on the auspicious occasion of the “Kumbhabhishekam” of the Temple of Kasi Viswanatha Swamy, Kalpathy, Palghat. In that performance, his Violin accompaniment was by the late Kandadevi Alagiri Swamy and on the Mirindangam by the late Sangitha Kalanidhi Palghat T.S. Mani Iyer. He was 69 years of age then and his performance lasted for four hours. The piece-de-resistance of the performance was “Akshyalingavibho”, a krithi of Muthuswami Dikshithar, in “Sankarabharanam” in praise of Lord Shiva, an apt krithi to suit the occasion. He ended the performance with Gopalakrishna Bharathi’s “Varugalamo Ayya” in the raga “Maanji” and “Satre Vilagi Irum pillai, sannithanam maraikuthe” in the raga “Poorvi Kalyani” requesting Lord Nandikeswara to make way for his direct darsanam of Lord Siva. Some of the old people who are still alive and who had heard him sing those songs said their eyes were moist. It was his swan song. It looked as though he was imploring the Lord to take him to His abode. A fortnight later Rama Bhagavathar, as was his habit, went to the Nila River in the morning for his usual bath and “Sandhya Vandhanam”. After his bath, he was performing “Sandhya Vandanam” and while offering Argyam, he passed into eternity. Rama Bhagavathar was a great devotee of Lord Rama. He lived a pure life, devoid of ego, anger and avarice. He totally shunned publicity, music was not just a means of earning his keep, more importantly it was the medium through which he sought to establish communion with Lord Rama. He was a nadopasaka, par-excellence. The Krishna Ghana Sabha, Chennai honored Rama Bhagavathar by unveiling his portrait in the Sabha’s premises. The late Sangitha Kalanidhi Semmangudi Srinivasa Iyer presided over the function and paid glowing tributes to the Bhagavathar. The Music Academy Chennai has also honored Rama Bhagavathar and his guru Ananatharama Bhagavathar by unveiling their portraits. An endowment has been instituted in the Music Academy, Chennai by the Bhagavathar’s third son, M.R. Venkataramanan, Chartered Accountant and his family for an award to be given to the best performer in “raga alapana”during December Music Season every year. Rama Bhagavathar’s Rama Nee Evaru” in the raga “ Karaharapriya” still remains unsurpassed. Such was his genius and glory. Will there be another Rama Bhagavathar like him?